All Philadelphia homes currently listed for sale in Philadelphia as of 04/22/2019 are shown below. You can change the search criteria at any time by pressing the 'Change Search' button below. 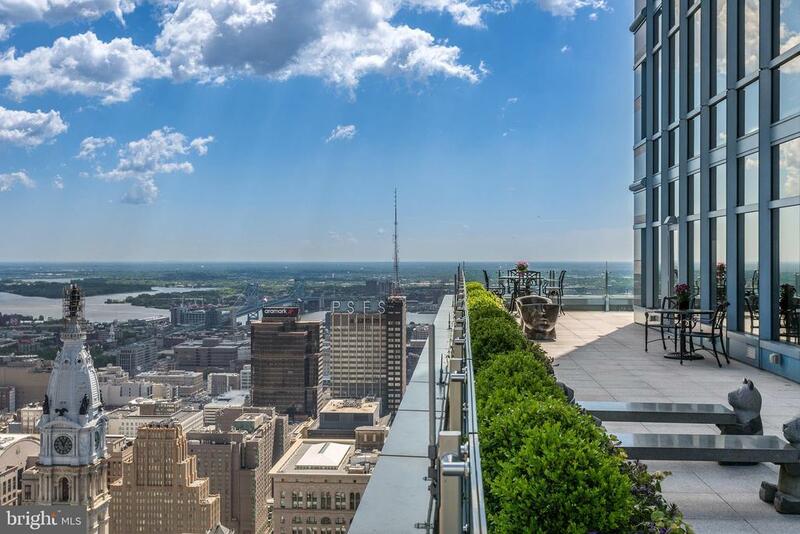 "This world-class residence, occupying half of the 46th floor of Two Liberty Place, offers unparalleled views of Philadelphia, City Hall, the Ben Franklin Bridge, and both the Delaware and Schuylkill rivers. Notable for its approximately 2400 square-foot terrace and views to the east, west and north, this home lends itself to extraordinary entertaining atop the city. To experience this home is to feel refinement and sophistication, classicism and quality wrapped by floor-to-ceiling windows and breathtaking views. Custom interiors were designed to comfortably host a crowd and offer a graceful nod to the Art Moderne period. The reception foyer is distinguished by a dramatic tile floor mosaic. Just beyond is a spectacular living room with a bioethanol fireplace and multiple seating areas. The dining room, kitchen and breakfast room access the main terrace, creating light-filled spaces. The ultra-modern kitchen with island accommodates a caterer and staff with ease but also serves as a superbly equipped workspace for the home chef. A temperature-controlled, 1,500-bottle wine room and full-service bar complement the kitchen/dining experience. All is in like-new condition. A family room and library are more casual yet still exquisite living spaces both with access to the terrace. The vast master suite features two dressing rooms, walk-in closets, and sitting room which opens to a terrace with spectacular views of Philadelphia. The master bathroom features beautiful Carrera marble. There are two laundry rooms and two powder rooms, and a second bedroom for guests. Building amenities include a fully equipped gym, endless pool, conference room, billiard room, concierge, doormen, and a chauffeur driven town car. Valet parking is available for you and your guests for an additional fee. Centrally located with the best of everything Philadelphia has to offer. Convenient access to all regional rails, helipads and the international airport." "Welcome to The Laurel. Named for Pennsylvania~s state flower, The Laurel introduces a lifestyle worthy of this final residential opportunity on prestigious Rittenhouse Square. With hotel-like amenities included for all owners, we offer the carefree enjoyment of city living. The meticulously curated array of services and amenities include an indoor and outdoor saltwater pool along with a stunning club room and expansive terrace overlooking the Square. ~Above it All~ with panoramic vistas of city and sky, The Laurel will be the tallest all residential building in Philadelphia. The Park View Estate is a half floor made up of approximately 4700 square feet was designed to satisfy the most discerning homeowner. The elegant double door entry opens up to a formal living/dining area with unparalleled southern views. To the east, with breathtaking views of the Delaware River, A chef's dream kitchen awaits offering cabinetry by Hans Krug, an oversized kitchen island with Quartz countertops waterfall edges, a large vaulted sink with Dornbracht faucet, Miele dishwasher and under-counter drawer microwave. The appliance package includes a Sub-Zero integrated refrigerator, a Wolf gas cooktop, state of the art steam oven and full size convection oven. The southwest wing of The Park View has been dedicated to the owner~s suite. This carefully designed suite offers a spacious bedroom with sitting area and a private balcony where views of sunset can be enjoyed at the end of each day. There is an abundance of closet space, private den and an elegant bath. Our on-site Sales Gallery is open 7 days a week and is located at 1845 Walnut Street, Suite 1911. You can schedule an appointment with us Monday-Friday 10:00AM-6:00PM and Saturday-Sunday 11:00AM-5:00PM at 215-977-9777"
"500 Walnut , Philadelphia's most exclusive residential tower is located directly across from Independence Hall and the surrounding parks. Developed by the acclaimed Scannapieco Development Corporation, developers who have garnished a reputation for being Phila's ultra-luxury developer, this tower will feature only 34 residences for the ultimate in privacy, a fully automated parking system of 85 spaces including the country's first induction charging for electric cars and a host of world class amenities including a guest suite and a 4,000 square foot treetop terrace overlooking Independence Hall. There will be a full service concierge and doorman as well as a Tesla town car and driver available to take you wherever you need to go within the city or to the airport or train station. All designed to create a wonderful lifestyle without compromising space. Take one of the high speed priority service elevator that will open to your private foyer which serves as the entrance to this spectacular This 4300 square foot residence with unprecedented views of the birthplace of America to the north, the river to the east and the sun drenched views to the south. The condo will feature, high ceilings, floor to ceiling windows, a vented gas fireplace, 3 bedrooms, plus a den that could be a fourth bedroom and there is a media room as well, laundry room and 3.5 baths. There are two terraces, one to the south off of the master bedroom perfect for enjoying that morning cup of coffee and an expansive 20 foot long by 8 1/2 foot deep balcony off of the main living perfect for entertaining. This is city living with the luxury of spaciousness. While 500 Walnut offers a choice of exquisite floor plans, they also recognize that you may have your own ideas. That's why they are the only developer in Philadelphia who invites you to have your own architect work in tandem with their team to help you create a home that is unmistakably yours. 500 Walnut is the perfection of every concept of luxury "
"Enter your full floor residence with direct elevator access at Philadelphia~s Premier Address -1706 Rittenhouse Square Street. Located in the Heart of Rittenhouse Square, 1706 offers the ultimate combination in privacy and luxury. This Modern, smart-wired, home boasts extraordinarily high ceilings, floor-to-ceiling windows, and sensational light with spectacular 360 degrees of Astounding skyline views! This home features 4,166 square feet, four spacious bedroom suites 3.5 baths, and two balconies that offer remarkable views! Step directly off the elevator into the marble foyer that opens to the Stunning Living Room featuring a fireplace and south-facing balcony. The dining room has a wet bar and temperature controlled wine cellar. The South- west facing, custom eat-in Joanne Hudson kitchen has Carrera marble countertops and is equipped with the finest appliances. The Luxurious Master Suite has a fireplace, abundant closet space and a large lux marble bathroom. Come home to World Class service and amenities including 24-hour doormen, Concierge, State-of-the-Art Fitness Center, which includes a Sauna, Spacious Lap Pool and a whirlpool. Enjoy the Lushly Landscaped Residents Garden with a Koi Pond! Retrieve your Vehicle from the Fully Automated Parking System or use the Chauffeur Driven BMW 7-Series Town Car. Two Car Parking!" "Location, location, location! 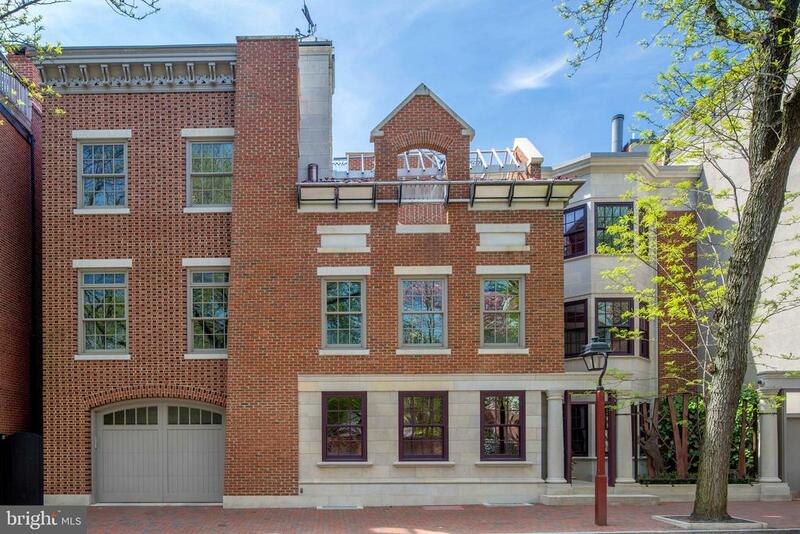 One of only two townhomes on Rittenhouse Square; the home boasts magnificent, unobstructed views of The Square. 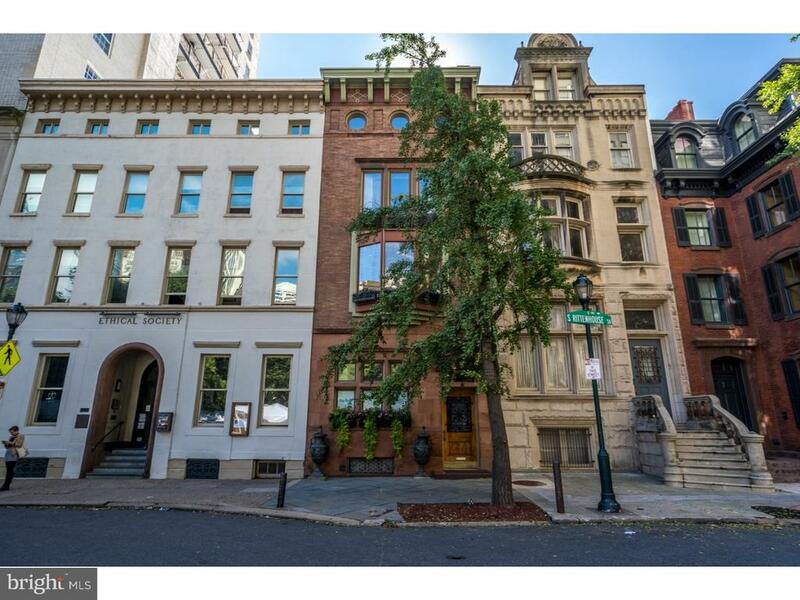 The residence has 20~ of frontage along Rittenhouse Square and extends all the way back to Manning Street where there is access to a private, underground 2-car tandem garage. The first floor of the townhome features a foyer, study, entertainment room with wet bar, a second study or den and a powder room. The second floor of the townhome has a living room with working fireplace; dining room with working fireplace and ceiling mural done by a well-known European church painter; kitchen with granite countertops, custom stainless cabinets, a Sub-Zero refrigerator and an island; and a powder room~The third floor offers three bedrooms (currently being used as one bedroom, a dressing room and an exercise room) , a media room with built-in bookcases, a full bathroom and a powder room~The fourth floor is a large master suite with curved wall architectural detail and three porthole windows. The lower level of the house is home to a two car tandem garage, laundry room, full bathroom and storage room. There is an atrium over the central staircase that runs the height of the home; the top of the atrium has a custom Charles Ross sculpture. All finishes, details and appointments were custom designed and installed for this house and are of the highest quality." "SOHO MEETS SOCIETY HILL!!! ONCE IN A LIFETIME OPPORTUNITY to own one of the FINEST & MOST UNIQUE properties ever offered for sale in Philadelphia! Quietly Nestled on Society Hill's most desired Tree~ Lined Cobblestone streets with 60 FEET OF FRONTAGE & Perfectly Sited across from the Physick House Museum Gardens & Three Bears Park, 328~330 Delancey Street is a Masterful Blend of Traditional Architecture and Modern Design encompassing multiple years of collaboration, planning & execution between architects, designers & Artisan Craftsman utilizing the very finest materials & standards to build this ONCE IN A LIFETIME PROPERTY with no expense spared... Amenities include 5 Bedrooms, 5 Full Baths, 3 Half Baths, Automated Garage w/ Lift & Underground Parking (Capacity for 6+ Cars), Elevator w/ stops to 5 Levels, Rooftop Swimming Pool, Hot Tub & Entertaining Area, Fully Automated Movie Theater w/custom lighting, seating, wet bar, dishwasher, refrigerators & ice maker, CHEF's DREAM KITCHEN w/ Barrel Vaulted Mosaic Glass Tiled Ceiling, Furniture Quality Hand~made Cabinetry, Soapstone Island, Counters & Sinks, Subway Glass Tiled Back~splash, Professional Appliances(Thermador Range, Sub Zero Refrigerator(s) & Miele Dishwasher) & Breakfast Room w/Fireplace & Built~In Banquet, LUXURIOUS MASTER SUITE w/ Sky~lit Atrium, Indoor~Outdoor fireplaces, Private Deck w/ SPECTACULAR VIEWS, His & Her ROOM SIZED Walk~In Outfitted Closets, His & Her connecting SPA~LIKE Master Bath w/ Imported Marble, Granite & Glass Tiles, Radiant Heated Floors, Steam Shower, Sauna, Deep Jetted tub & 4 Sinks, In~Law & Guest Suites, 2 Home Offices, Whole~House ZON Sound System, MULTI~ZONED RADIANT HEATED FLOORS, State of the Art Infrastructure (Plumbing, Electrical, HVAC, Security & Fire Suppression), Kolbe & Kolbe Custom Windows, Central Vacuum System, Extensive use of Exotic Woods including Cherry, Santos & Sepele Mahogany, Plaster Veneer Walls specially insulated for noise and temperature control, extensive"
"Meet the newest Luxury building in Philadelphia- The Laurel is the last opportunity to own a new condominium on historic Rittenhouse Square. The striking glass tower soring 48 stories is a masterpiece of contemporary architecture designed to inspire. The Laurel offers quarter floor Sky Residences, half floor Estates and full-floor customizable Penthouses. Paired with an incomparable array of elevated amenities and personalized services, each residence fulfills a vision for the ultimate in contemporary condominium living. The City View Estate is a 3700 square foot unit located on the north side of the Laurel and offers views in 3 directions. The grand entrance opens to the spectacular views of our city skyline. With breathtaking views of the Delaware River in the morning and skyline views at night, this home has no equal. A chef's dream kitchen awaits offering cabinetry by Hans Krug, an oversized kitchen island with Quartz countertops waterfall edges, a large vaulted sink with Dornbracht faucet, Miele dishwasher and under-counter drawer microwave. The appliance package includes a Sub-Zero integrated refrigerator, a Wolf gas cooktop, state of the art steam oven and full size convection oven. To the west, you will enjoy an expansive master suite with a balcony perfectly placed for relaxing and gazing at the sunset after a long day. Featuring two large dressing rooms and a master bath this home is sure to WOW! The master bathroom includes an expansive shower with Fantini shower fixtures. The luxurious freestanding soaking tub sits atop stunning marble floors surrounded by floor to ceiling porcelain walls. Our half floor units include a secondary entrance through the laundry room with full size Maytag washer and vented dryer. Our on-site Sales Gallery is open 7 days a week and is located at 1845 Walnut Street, Suite 1911. You can schedule an appointment with us Monday-Friday 10:00AM-6:00PM and Saturday-Sunday 11:00AM-5:00PM at 215-977-9777"
"I knew the moment I entered that house it was the right one. The house itself is beautiful in its simplicity and its lines. It is a French house, more than a century old... - Pearl S. Buck, Nobel Prize Winner Built in 1860 in the Federal Style and later recast in the Beaux Arts style, with a magnificent limestone fa~ade, by the Philadelphia architectural firm of DeArmond, Ashmead & Bickley. The home was purchased in 1964 as the home of Pearl Buck and the Pearl S. Buck foundation. 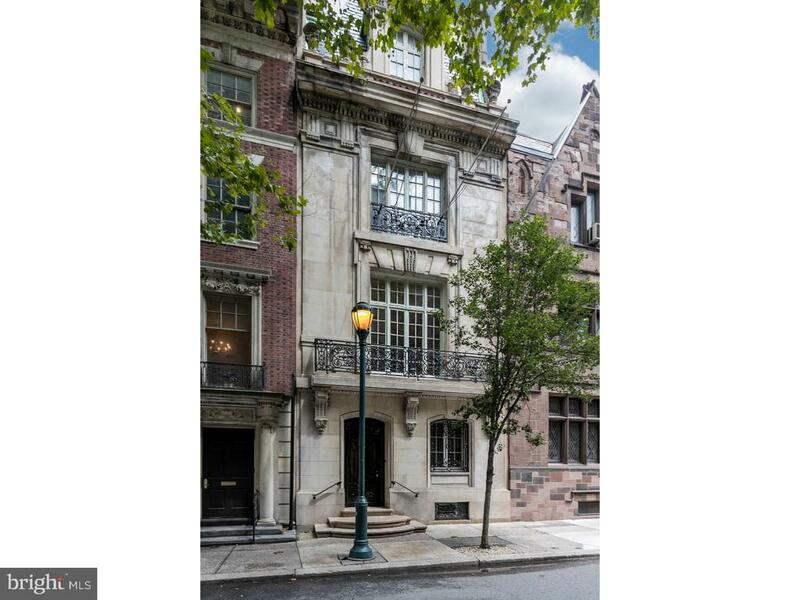 It was in this Center City house where Nobel prize winner, Ms. Buck, the women's right crusader, philanthropist, humanitarian and author compiled her 1972 short story collection, Once upon a Christmas among others. One enters the home to a magnificent entrance hall/reception area. There is a sweeping staircase, a huge eat- in kitchen that seats eight and two islands, one butcher block, and one granite. The second floor features a Living Room, formal octagon shaped Dining Room and Sun Room. There are four bedrooms including a sumptuous master suite, plus a family room, five full baths, four powder rooms, garage, three balconies, elevator, 2 gas fireplaces, 2 wood burning fireplaces, wine cellar, gym, storage, 2 offices, catering kitchen, and dumbwaiter. Exquisite renovations started in 2006 and completed in 2008, by the present owners in conjunction with interior designer, Malcolm Eisenberg. The scrollwork door made by American master blacksmith and metal designer Samuel Yellin." "Rarely available entire floor showplace at the highly coveted 1706 Rittenhouse, only one-half block from Rittenhouse Square. 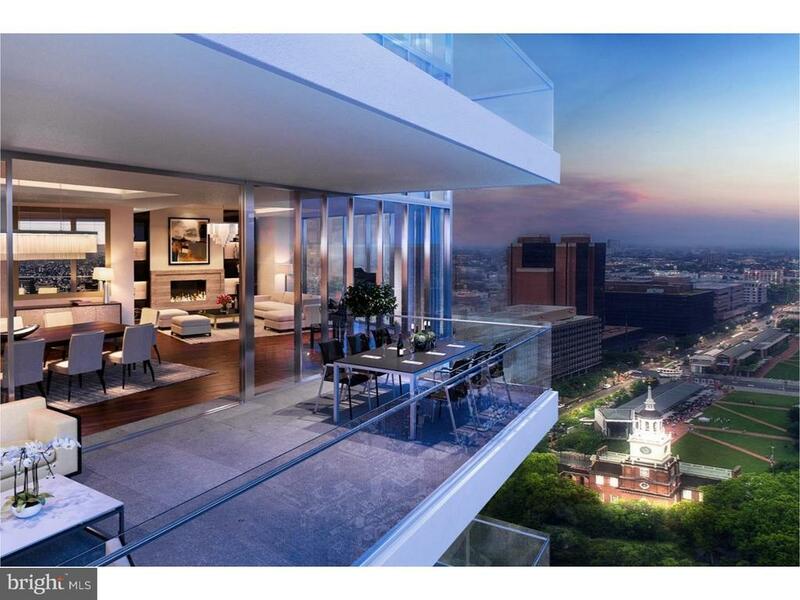 This 3 bedroom plus den, 2.5 bathroom showcases 360-degree city views from walls of windows in all rooms. Enter the condominium directly off the secure elevator into a private vestibule. A set of French doors opens into a sun-soaked living room offering several gallery walls, space for multiple seating areas, a Juliet balcony and see-forever views to the south. Open to the living room is a formal dining room providing access to a 16' balcony. There is a chef's kitchen boasting a large breakfast nook, incredible cabinet and counter space, large breakfast bar, tile floor, granite countertops and commercial grade appliances including a Wolf range, wall oven and microwave and Sub-Zero refrigerator/freezer. The other side of the residence features a luxurious corner master bedroom suite with custom built wall and walk-in closets and a bathroom appointed in marble with a double vanity, private commode, soaking tub and seamless glass enclosed walk-in shower. One guest bedroom enjoys sunrise city views to the east and skyline views to the north with easy access to a full hall bathroom. The other guest bedroom was most recently used as an art studio and can easily be converted into a bedroom suite with the addition of a bathroom. There is recessed lighting throughout and there are hardwood floors in the foyer, living room and dining room and carpet in the bedrooms and den. Additional home highlights include a den/office, powder room, laundry room with utility sink and side-by-side washer and dryer, and a utility room with access to the service elevator. One parking space in the building's garage and one storage space are included. Residents enjoy amenities that are second to none, including a 24-hour doorman, automated parking garage, heated indoor pool, state-of-the-art fitness center, chauffeur driven 700-Series BMW and landscaped garden with Koi pon"
"Located directly on Rittenhouse Square in The Barclay Condominium, this stunning residence blends modern updates with restored original details. While there is direct access between the units, they can easily be separated by closing a door and using their respective hallway entrances. Condominium 16B is a corner three bedroom plus den, three and a half bathroom with unobstructed Rittenhouse Square views to the west and sun-filled views of the city to the south. There is a grand gallery running the length of the home with 10' ceilings. 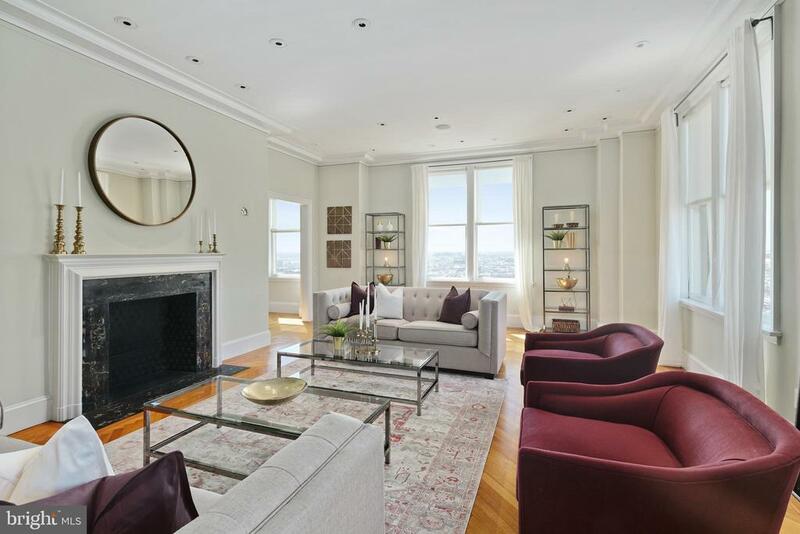 A large living room, library/den with wet bar and bedroom suite all offer direct views onto Rittenhouse Square. On the other side of the living room is a sun-soaked formal dining room which leads into the chef's kitchen. The Bulthaup designed kitchen features custom cabinetry, granite countertops, a huge center island with breakfast bar, and high-end appliances including a Sub-Zero refrigerator/freezer, two Miele dishwashers, and Gaggenau wall ovens. The entire rear of the condominium is a lavish master suite boasting his and hers bathrooms and an entire dressing room. Additional home highlights include an additional bedroom, powder room and laundry room. Condominium 16C is currently configured as a one bedroom, one and a half bathroom with an office or second bedroom. No detail has been left undone in this one-of-a-kind residence. All moldings, millwork, flooring, lighting and built-ins are beautifully designed and customized for this home." 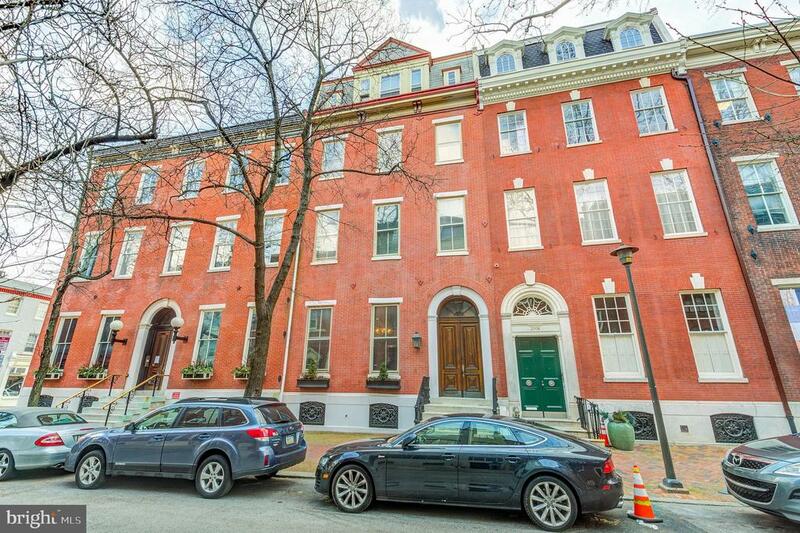 "Classic Federal style Delancey Place townhome--built in the 1860s--on one of Philadelphia~s most beloved blocks, only steps from Rittenhouse Square. While every inch of the home has been thoughtfully modernized, the residence also boasts restored original architectural details throughout. The brick fa~ade of 1830 Delancey Place reaches four stories high and three windows wide (approximately 20~). Highlights of the home include five bedrooms, four full bathrooms and two half bathrooms, two dens, an elevator that stops on every floor, beautifully landscaped backyard patio and roof deck, eight gas fireplaces with carved ornamental mantels, exquisite plaster and millwork, and a two car tandem garage. All finishes, appointments, and details are of the finest quality and design, from the flooring, moldings, lighting, hardware, window treatments and beyond. Enter 1830 Delancey Place at street level through a pair of handsome double wood doors into a vestibule leading to the foyer. To the right of the foyer is the formal living room featuring two oversized windows looking onto Delancey Place, a wall of bookshelves and a gas fireplace. The formal dining room sits beyond the living room, connected by a small hallway with powder room, and offers a wall of built-in china cabinets, a gas fireplace and French doors that open to the back and side yard landscaped patio. The rear of the first floor houses the chef~s eat-in kitchen, complete with herringbone wood floors, two tone wood cabinetry, Carrera marble countertops, a large island with seating, gas fireplace, raised breakfast nook with bookshelves and hidden coffee station, and a concealed desk area. Kitchen appliances include a paneled Sub-Zero side-by-side refrigerator/freezer, full size Sub-Zero wine refrigerator, Miele paneled dishwasher and stainless steel Dacor double wall over and gas cooktop. The striking central staircase located in the foyer leads to the second floor which has a den/library offering a wall of bookshe"
"Incredibly wide at 26 feet and with soaring 14 foot ceilings, this important residence provides an unmatched combination of space, volume, significant original character, and, of course, Philadelphia's premier address. Tasteful, custom finishes throughout, along with multiple large spaces, provides the perfect mix of flexible and formal; everyday living and any-scale entertaining; a peaceful elegance that is part of a true world-class neighborhood. 2-car GARAGE, spacious outdoor living, 6 bedrooms, 5 full baths, 2 half baths, family rooms, flexible space, office, studio, serene all-season sun room, and finished lower level. The main living floor has several spaces perfect for whatever your needs--traditional living and dining or a more contemporary living, dining, family, great room--all open to the big and bright beautiful Clive Christian eat-in kitchen with all season sun room and walk-out two-level patio. This main level offers 2,000+ sq. ft. of the most desirable gathering spaces for family and friends, and entertaining of all kinds. The highlights of this residence also include an amazing second floor master suite (12' ceilings), large bedrooms throughout, original hardwood floors and gorgeous woodwork throughout, huge windows, and substantial storage space. Numerous major upgrades throughout (to both systems and finishes). So much more to see and feel, such as the grand hallways and spectacular light. 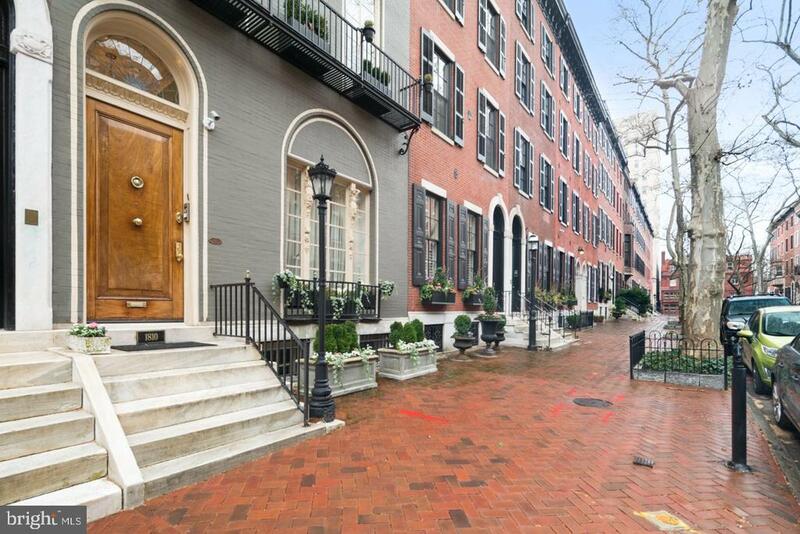 This historic townhome (built for physician James McCrea and his family in 1865), is a magnificent Philadelphia classic, on one of nation's most beautiful blocks." "This classic 1814 Federal Style Society Hill mansion captures the soul of historic Philadelphia. Value begins at its almost 26' width, 14' ceilings, original pine floors, restored plaster mouldings and sweeping staircase that rises softly from floor to floor. The home's east/west exposures and large paned windows (3-across) insure bright natural light throughout the home. The grand Federal proportions offer elegance to any personal style of living or entertaining. Of course, its marbled baths, elevator service to all five floors and Clive Christian kitchen seamlessly deliver the modern luxury you'd expect from this caliber of home. The chandeliered entry foyer gives way to the grand hallway which features an original work of art by White House muralist Zuber & Cie. The hallway is the home's gateway to both its public and private areas. The first floor is home to both formal living and dining rooms; both complete with antique crystal chandeliers and gas burning fireplaces. In addition, the hallway provides access to the grand stairs, elevator, powder room and fabulous eat-in chef's kitchen which overlooks a formal garden with fountain and immediate access to your parking. Halfway up the staircase you'll find a family/den/library room for more casual living, complete with custom wood cabinetry and powder room. Up another ~ floor to the 2nd is master suite with fireplace, his & her walk-in closets and luxurious marble bathroom. This floor is also home to a private office. Up to the 3rd floor you'll find a guest suite w/ marbled bath, two additional bedrooms and full bath along with storage upon storage. The 4th floor is set up with a custom wet bar, media room, half bath, greenhouse and spectacular views of the city and bridges. The 1,980 sq. ft. lower level has been beautifully renovated and home to an au pair suite w/ full bath, large multipurpose room, sauna and gym. Also includes One (1)gated car parking at $1,250 a year"
"Located in the heart of Rittenhouse, this 4100 sq ft full-floor condominium combines classic loft features with modern touches throughout. With multiple exposures overlooking charming Philadelphia streets this residence is bursting with natural light from end-to-end. From the key-locked elevator, a private vestibule leads to the 32 ft grand living area with a fireplace and access to one of two luxurious terraces. This room naturally flows into the dining room and den with access to the second terrace. Follow through to the spacious chef's kitchen. Hand-crafted stone countertops, tile backsplash, granite center island, custom-milled wood cabinetry, and restaurant-grade appliances make this kitchen a culinary enthusiast~s dream! The stately corner master suite features oversized windows with spectacular city views and a 22 ft custom-fitted dressing room. The spa-quality master bath is clad in marble with a double vanity, an sizable glass-enclosed shower and soaking tub. There are 2 additional bedrooms and 2 additional baths. The entire residence is thoughtfully laid out combining classic loft features with modern purpose. A laundry room, 2 car parking, 4 zone split-system central air conditioning, endless closet space, hardwood floors throughout and custom solid-core wood doors complete this pin-drop quiet residence. The large floor plan and numerous windows provide total flexibility and can easily accommodate additional rooms and alternate floor plan possibilities. 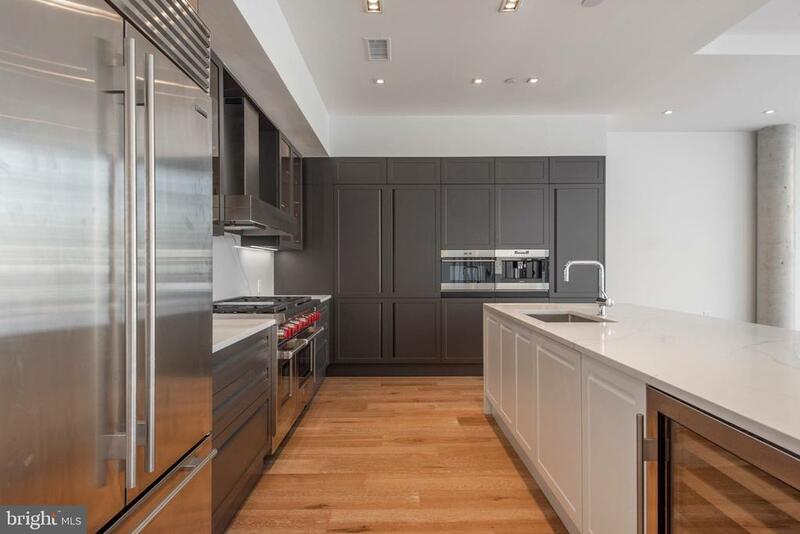 1706 Rittenhouse Square is a modern boutique condominium building with private keyed elevator, digital video security, 24hr Concierge, Indoor Lap Pool, Sauna, Fitness Center, resident's garden and a Chauffeur Driven BMW 7-series. All this with world-renowned retail and culinary destinations at your front door not to mention virtually every transportation line within short blocks." 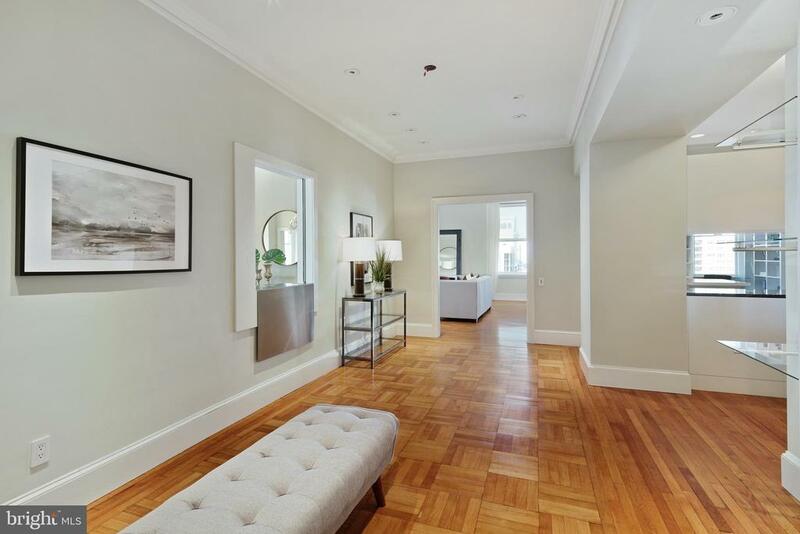 "Located directly on Rittenhouse Square in The Barclay Condominium, this stunning residence blends modern updates with restored original details. Condominium 16B is a corner three bedroom plus den, three and a half bathroom with unobstructed Rittenhouse Square views to the west and sun-filled views of the city to the south. There is a grand gallery running the length of the home with 10' ceilings. A large living room, library/den with wet bar and bedroom suite all offer direct views onto Rittenhouse Square. On the other side of the living room is a sun-soaked formal dining room which leads into the chef's kitchen. The Bulthaup designed kitchen features custom cabinetry, granite countertops, a huge center island with breakfast bar, and high-end appliances including a Sub-Zero refrigerator/freezer, two Miele dishwashers, and Gaggenau wall ovens. The entire rear of the condominium is a lavish master suite boasting his and hers bathrooms and an entire dressing room. Additional home highlights include an additional bedroom, powder room and laundry room. No detail has been left undone in this one-of-a-kind residence--all moldings, millwork, flooring, lighting and built-ins are beautifully designed and customized for this home." "An incredible offering, of a design by Horace Trumbauer, famous to Philadelphia, for his architectural contributions, at the turn of the Century. This luxurious building is being offered, as a single family town home residence. This is a once in a lifetime opportunity to create your home around your City Lifestyle. 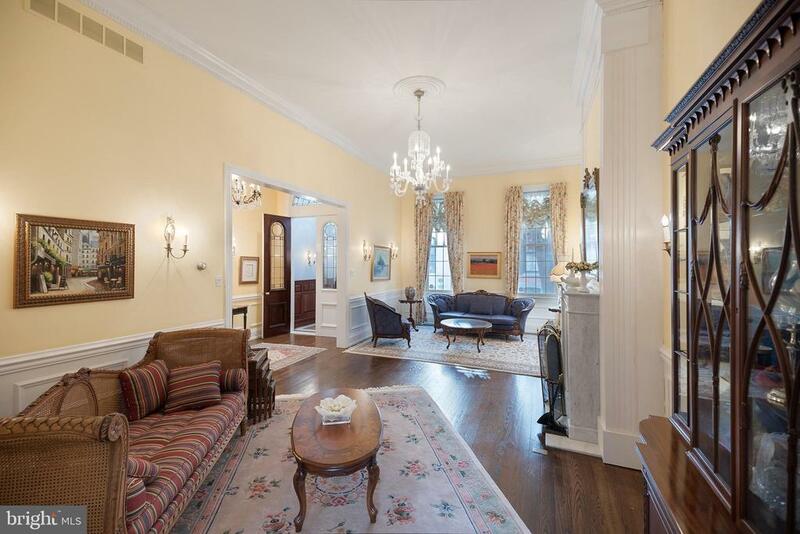 This setting is in a sought after location, near Rittenhouse Square." 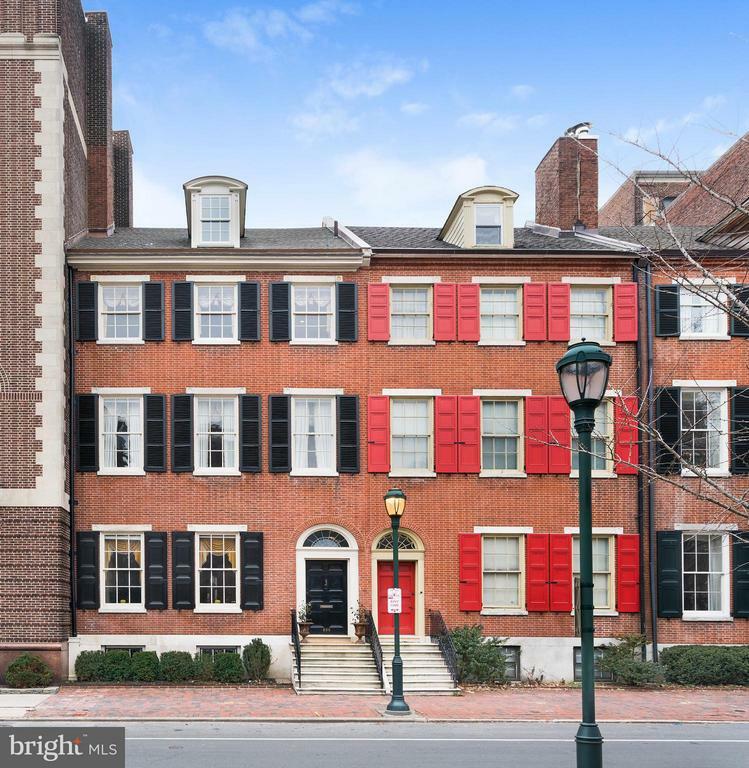 "Originally constructed in the 1800's as one of three spec homes, this townhouse is one of Philadelphia's most distinguished properties. Situated on the city's historic Washington Square, it offers a rare opportunity to acquire a residence of extraordinary grandeur. 6000 sq ft, 25-ft-wide and built to nearly the full depth of the 2100 sq ft lot, the townhouse provides an immense urban footprint with 2 car gated parking. The formal entry opens onto classic Georgian marble floors lining a 60 ft entry hall with 12 ft ceilings, and a handsome staircase. To left is an elegant Louis XIV style living room with wide-plank wood floors, marble fireplace, and moldings illuminated with an antique chandelier. Continue through to the dining room also with crown moldings, a magnificent marble fireplace and chandelier to mirror the living room. Adjacent is the traditional kitchen with gorgeous quartz countertops, backsplash and custom wooden cabinetry overlooking the 3 story solarium providing a tranquil backdrop for the sprightly chef. The kitchen gives access to the gated private patio lined with greenery ideal for relaxing over morning crosswords and coffee. Accessed by elevator or staircase, the upper living quarters on the 2nd and 3rd floor each have 2 master bedrooms with en-suite marble baths, ample closet space, a fireplace, and wide plank floors. The 4th floor suite, currently used as a study, features a fireplace, built-in shelves, full kitchen and marble bath. 2 large windows and french doors dispense bursting natural light and give access to the peaceful roof terrace. The lower level, accessed by the atrium, invites you into a cozy masonry stone library and sitting room with fireplace. There is additional custom library shelving in the next room which also features a kitchen with a wood burning fireplace, a full bar, wine storage and a comfortable dining area perfect for entertaining. This level also provides access to the 3 story enclosed solarium, a horticultural hidea"
"Located at 1810 Delancey Place in Rittenhouse Square, this stunning 20-foot wide townhouse has undergone a magnificent renovation. Offering approximately 4900 above grade square feet across 4 stories plus a newly added roof top terrace. 1810 Delancey Place features a landscaped frontage as well as a beautiful Italianate facade with a Juliette Balcony on both the first and second floor. With 6 bedrooms, 4 full bathrooms, 2 half bathrooms, and rooftop terrace, offers the perfect combination of grand scale, beautiful and modern finishes and streaming light courtesy of the house's unique south, north and west exposures from large windows and French Doors.A gracious gallery leads into the home's living room and dining area, both with marvelous moldings. The living room with gas fireplace and French Doors that lead onto Juliette balconies. An impressive and elegant curved staircase leads into the home's custom designed Joanne Hudson eat-in kitchen. Designed for the premiere chef, the kitchen is truly a room for gathering. Custom cabinetry, brilliantly crisp marble countertops and backsplash, top-of-the-line appliances by Sub Zero, LeCornue Fe stove and oven and handmade German sink are illuminated by restored leaded glass windows. All this share a welcoming sitting room with gas fireplace to cosy up and read a book.A powder room tucked away complete the Entry Floor.The sumptuous master bedroom, located on the Second Floor, features a gas fireplace, an en-suite marble & mosaic bathroom with custom finishes and fixtures, as well as walk-in closet plus additional wardrobe storage. The Second Floor rear features a Library with large windows, custom cabinetry and gas fireplace. There is laundry on this level. The Third Floor includes three generously sized bedrooms, two bathrooms and plentiful closets. Unique to the house is a double-height media room on the Fourth Floor with a soaring ceiling. The ceiling is sky-lit allowing natural light to flow within. 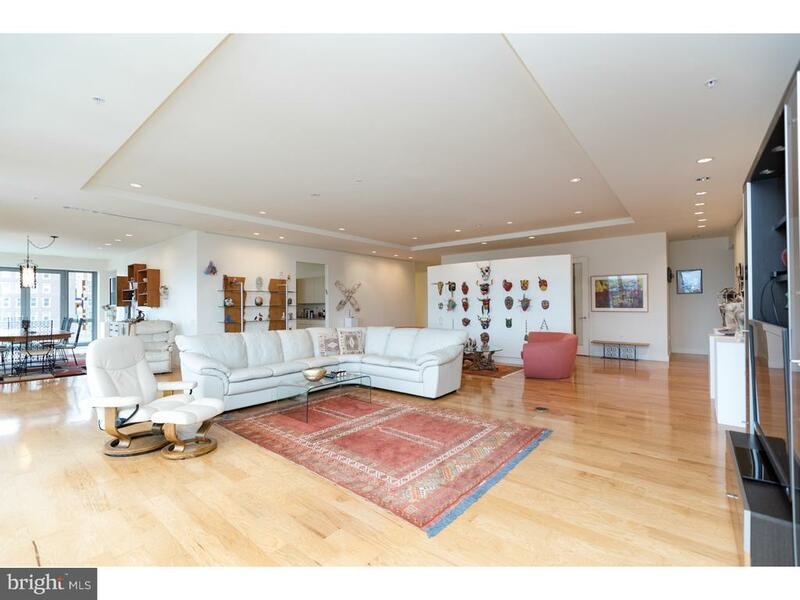 There are 2 additiona"
"A Magnificent Modern Masterpiece located in The Barclay Condominium overlooking Rittenhouse Square. No detail has been spared in this impeccably designed home configured with Three Bedrooms, Three and a Half Baths and a large Study. The features include 10ft ceilings; fine finishes and wide plank walnut floors. Distinguished by its exceptional and versatile layout, the beautifully scaled entertaining rooms are all entered off an impressive entry Gallery. 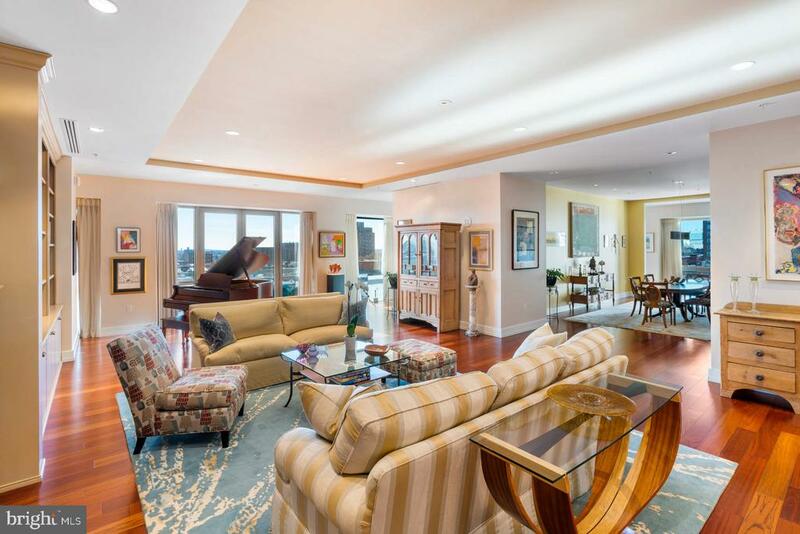 The open living room and dining room boast incredible treetop views of Rittenhouse Square. Southern exposures illuminate the main living spaces, master suite, and study providing streaming light and expansive views. The architect's, Christoff :: Finio of NYC, use of pocket doors and gliding privacy walls easily reconfigure your public and private spaces. The cutting edge, modern kitchen includes a SubZero and Gaggaenau appliances. The master bedroom suite is a perfect retreat with abundant closet space and custom cabinetry for maximum storage. The sleek master bath offers a large glass-enclosed shower, duel sinks, and beautifully finished marble floors. 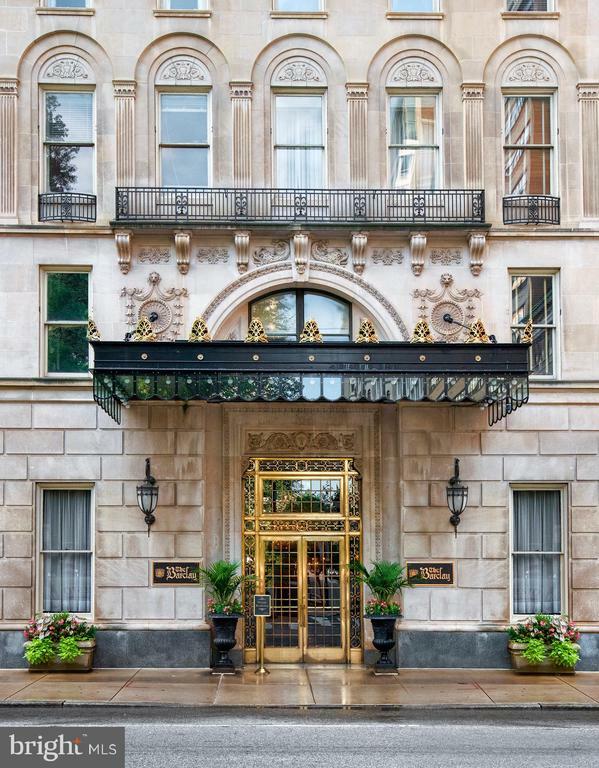 Enjoy modern conveniences wrapped in the historic grandeur of The Barclay Condominium. 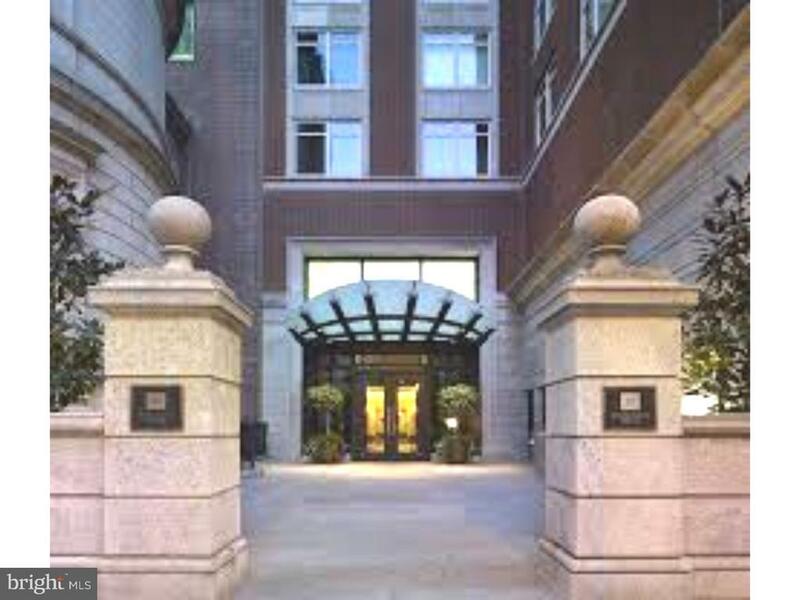 Amenities of the building include Full Time Door Staff, Fitness Center and a chauffeur driven Mercedes S550." "2110 Walnut is a new development project located in the heart of Rittenhouse Square. The actual development consists of the restoration of an existing Frank Furness structure(2108) combined with new ground-up construction of a 9 story building (2110). The final structure will have Walnut Street frontage adjacent to the existing 2108 property. The Residences at 2110 Walnut are designed with utmost grace and civility lavishly boasting modern amenities and leading edge technology. The 201 residence at 2110 Walnut is a combination of both a historic Philadelphia brownstone and a contemporary mid-rise development. The eventual occupants will be able to freely navigate a space between a preserved historic structure and a new development, distinguished separated by time but honorably joined by imaginative design. The access to a private large patio- garden offers a welcome relief from the vibrant energy of city life and a gentle retreat into the serenity of one~s home~." "Welcome to 10 Rittenhouse Square ? A Robert A.M. Stern design for Philadelphia's Ultimate Address. Enter this exceptional Penthouse level residence and be received in the Grand Foyer taking you to the impressive Entry Hall Gallery leading to the expansive great room and dining area all with rich Brazilian hardwood floors and a wall of windows featuring stellar views of the city's iconic skyline This expansive 2560 sq ft 3 bedroom 2 and half bath home has the expected level of luxury details, finishes and services that 10 Rittenhouse has to offer. The very large dine-in gourmet kitchen has entry from the gallery hall and beautiful French doors which open to the dining and great room area. Start your day in the sun filled breakfast area or in the dining area with three-sided floor-to-ceiling windows. A center island has an oversized breakfast bar area and generous storage. Pristine with all top-grade finishes, including, Kashmire granite counter-tops, Olivieri stainless steel sink, Poggenpohl cabinetry, Sub-Zero refrigerator, Miele dishwasher, Miele wall oven, Miele gas cook-top and a Viking hood.Quiet quarters include a main bedroom suite with luxury Carrera marble bathroom with frameless shower, sumptuous jet tub and two separate generous custom fitted walk-in closets. 10 Rittenhouse is a full-service concierge doorman building with Signature amenities to include a chauffeur driven Mercedes S550 town car at your service,state-of the-art fitness/strength training center,saline pool,yoga studio,board room,party room w catering kitchen, wine storage, bicycle storage, courtyard and garden terrace, guest suite for overnight guests and an array of services for residents.This residence includes one storage locker and garage parking license for one car, app 9 yrs. remain on the tax abatement.Designed,furnished and decorated by Philadelphia award winning design firm Freeman Interiors and completed to be a glamorous retreat.Dramatic details such as decorative moldings and "
"Welcome to The Laurel. Named for Pennsylvania~s state flower, The Laurel introduces a lifestyle worthy of this final residential opportunity on prestigious Rittenhouse Square. With hotel-like amenities included for all owners, we offer the carefree enjoyment of city living. The meticulously curated array of services and amenities include an indoor and outdoor saltwater pool along with a stunning club room and expansive terrace overlooking the Square. ~Above it All~ with panoramic vistas of city and sky, we are the tallest all residential building in Philadelphia. The Sky Residence 1(S1) is a 3 bedroom home located on the South East corner. The western views from the expansive wraparound windows in the living and dining areas showcase the beautiful sunsets over the Schuylkill River. Over 2500 square feet of luxury facing the Square awaits you. Featuring 10 foot ceilings, laundry room, wet bar and balcony overlooking Rittenhouse Square, this home is sure to ~WOW~! The custom built European kitchen cabinets by Hans Krug flow out to the balcony and into open living and dining areas. The appliance package includes a Sub-Zero integrated refrigerator, Wolf gas cooktop, state of the art steam oven and full size convection oven. The oversized kitchen island features Quartz counters with waterfall edges, a large under mounted sink, Dornbracht faucet, Meile dishwasher and under-counter drawer microwave. The Master bathroom is complimented by an expansive shower with Fantini shower fixtures. The luxurious freestanding soaking tub sits atop stunning marble floors surrounded by floor to ceiling porcelain walls. A laundry room with full size Maytag washer and vented dryer complete this magnificent residence.Our on-site Sales Gallery is open 7 days a week and is located at 1845 Walnut Street, Suite 1911. You can schedule an appointment with us Monday-Friday 10:00AM-6:00PM and Saturday-Sunday 11:00AM-5:00PM at 215-977-9777"
"2022 Delancey Place is a beautiful townhouse with a TWO CAR GARAGE and an ELEVATOR on the very distinguished 2000 block of Delancey. 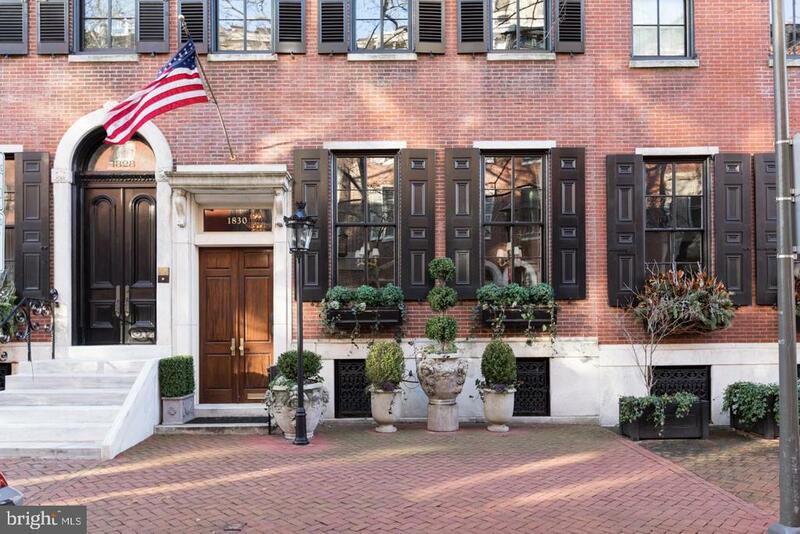 Located in the desirable Rittenhouse Square neighborhood, the residence includes a first floor with living room, formal dining room, kitchen with breakfast room, powder room and decks. There are four spacious bedrooms, den, office/library, exercise room, finished basement, four baths, three powder rooms, 2nd deck and a laundry room. The elevator goes from the lower level to the top floor. There are high ceilings, hardwood floors and the lot size is 22 X 100.This elegant home is a spectacular opportunity to live in comfort and style in a perfect location." 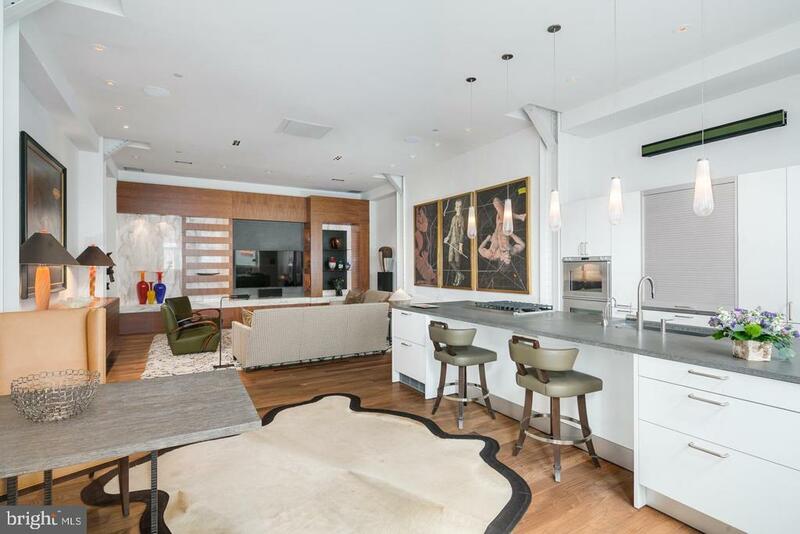 "ARCHITECTURAL CONTEMPORARY on Washington Square: Luxury will be your first thought when stepping into this 2,752 sq. 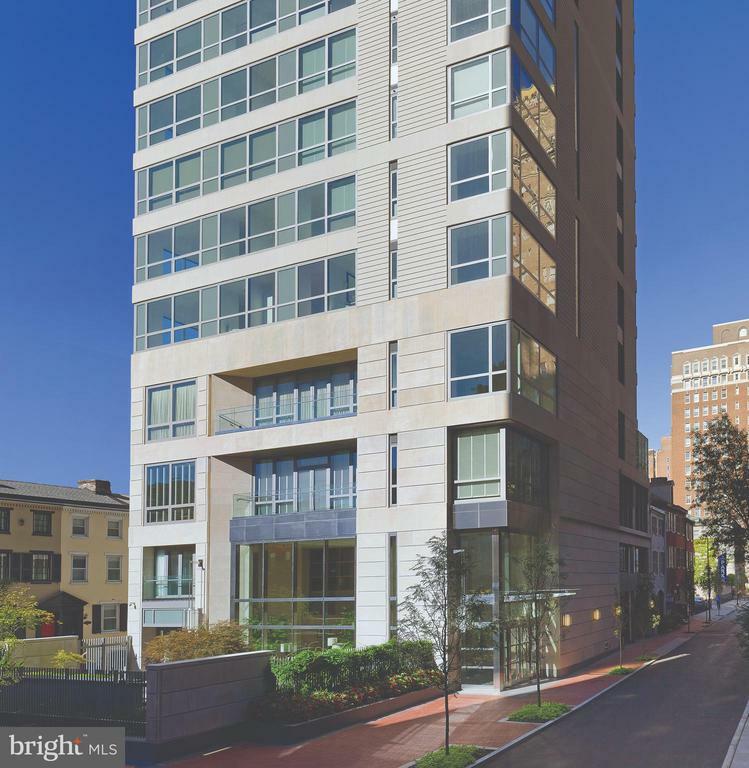 ft. 2 bedroom, 2.5 bath plus den condominium at the Lippincott. Architect, Stephen Verner (of Alex Wilson Architects, San Francisco) achieved a unique level of harmony by integrating strong design with high-end natural finishes. The residence has many unique features including its own private entrance from Locust Walk and 2-car garage parking. The entry foyer is an art collector's dream with its limestone floors and artisan finished plaster walls. An open plan great room features walnut floors, 14ft double ash doors, Calcutta gold marble and walnut bookcase/entertainment wall and chef's kitchen with Gaggenau and Miele appliances, basalt counters, double dishwashers and center island. The large master suite features a custom walnut bed and frame, sitting area, retractable television and European marbled bath. The 2nd bedroom and den also feature custom built-ins, wet bar and European bath. Additional details include 2-zone HVAC along with 3-zones of radiant floor heating. Your Lutron controller anticipates your lighting and privacy needs. Lastly, the warehouse sized windows run the length of the apartment and face south for extraordinary natural light."